Find Pier Sixty-Six Hotel & Marina deals, discounts and special offers. This hotel is a dependable choice for business travelers as well as pre- and post- cruise customers. 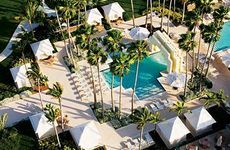 This luxury resort has a full service spa, rooms with beach and ocean views and vintage yachting décor. This property offers elegant Caribbean and French influence decor located just one block in from the beach. This elegant oceanfront resort is centrally located minutes from the airport, fine dining and nightlife activities. This Ft. Lauderdale resort offers Key West-style decor, 106 oceanfront suites and is near local dining and nightlife. This hotel overlooks the Intercoastal Waterway, a few blocks from the beach. Lago Mar is a beachfront resort nestled between the Atlantic Ocean and Lake Mayan in the Harbor Beach neighborhood. The Grand Resort is Ft. Lauderdale's largest gay resort offering a full service spa and salon. An oceanfront high-rise hotel, the Bahia Mar offers private beach access, water taxi services, and water activities. Luxuriously decorated accommodations centrally located to South Florida's beaches and trendy nightclubs. This B&B is a clothing optional, gay resort offering all the comforts of home centrally located to nightlife venues. This boutique gay hotel has spa services and is centrally located to Fort Lauderdale's gay nightlife. With studios and suites, the Elysium Resort is a large gay resort, and offers free continental breakfast and internet.